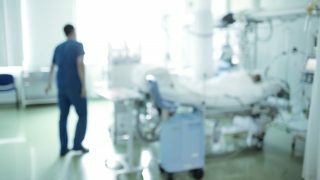 Hospital workers in Wigan, Leigh and Wrightington, in north-west England, will be mounting picket lines again on Friday (8 June) at the start of their second 48-hour strike. 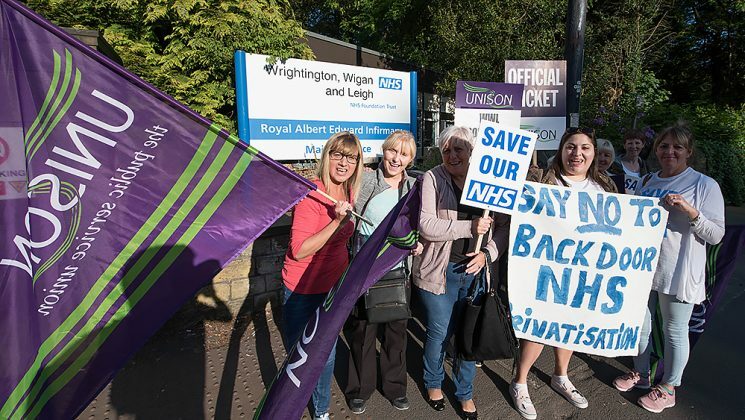 They first took action against the Wrightington, Wigan and Leigh NHS trust’s plans to transfer their jobs to a wholly owned private company, WWL Solutions, on 23 and 24 May. 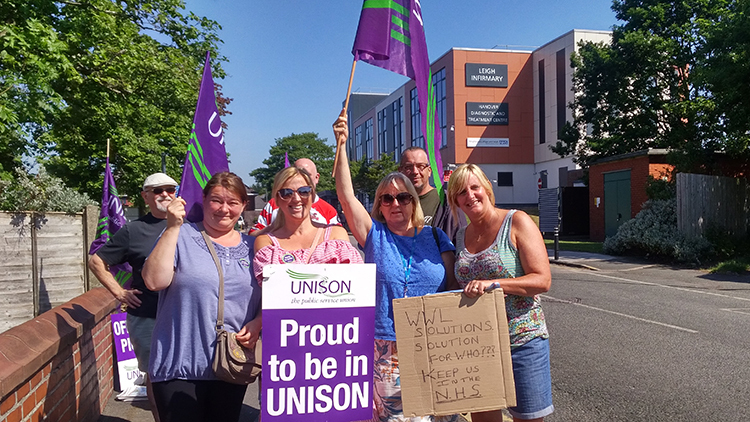 UNISON member Carol, a domestic at Thomas Linacre Centre in Wigan, was one of the workers who took strike action for the first time in her career then. 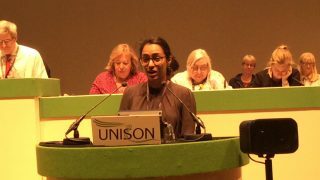 “I was a bit nervous about coming out on strike,” she recalled, “but we’ve all stood together and supported each other. The response from the nurses and doctors and the public has been great. We’ve had so much support. At the time, she hoped the two days of action would be enough, stating: “I hope the management sees sense”. An that’s what’s happening now, after management reacted by almost the exact opposite of ‘seeing sense’. 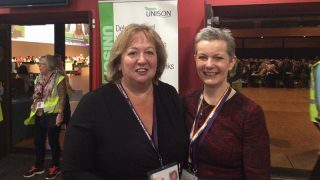 As the workforce prepares for their second strike to keep up to 900 jobs in the NHS and protect terms and conditions, UNISON regional organiser Lizanne Devonport declared: “It is time for Andrew Foster and the board to think again. “The trust needs to listen to its staff and drop its divisive and damaging plan to set up WWL Solutions. “Staff are taking a courageous stand to do all they can to keep the NHS together. There is lots of support for the strike action from colleagues, the public and community leaders. “Bosses have responded so far with unfounded accusations and insults. But staff are not stupid – they know that WWL Solutions can only increase risks to their jobs and livelihoods. And that was a theme picked up by members of the workforce. John Myles, from Chorley is a maintenance operative who has worked for the trust for five years. He says he is going on strike again because “I love my job and I love working for the NHS. This isn’t about money, it’s about saving the NHS. Porter Terry Knowles adds: “Management says it’s not privatisation – but if you look at the Companies House website, WWL Solutions is listed as a private limited company. It says what it is on the tin. “The vast majority of staff are against the WWL Solutions plan and we are all determined to see this through.